On the fateful day of December 2, 2013, the Icelandic Police finally shot and killed someone dead for the first time in their two hundred twenty-five-plus year history. Instead of congratulations, they ordered a round of counseling all around. Typically, the rank-and-file do not carry firearms, relying instead on plenty of optimism. That arrangement suits the new Serbian kingpin in town just fine. However, an Internal Affairs cop with a chip on his shoulder will try launch a secret operation against the gangster and the high level officer protecting him in Olaf de Fleur’s Brave Men’s Blood (trailer here), which launches today on VOD from Oscilloscope Laboratories. Hannes Ámason’s old man was a legend on the force, but their relationship was always rather frosty. It becomes even more so when he washes out of the elite training program for the SWAT-like Armed Police division. Frankly, it is easy to read plenty of resentment into his decision to subsequently take an Internal Affairs posting. However, a major case with implications beyond the force drops in his lap when old school gangster Gunnar Gunnarson requests a jailhouse meeting. Having been pushed out by Sergej, the Serbian upstart, Gunnarson is slightly out of sorts. As a last resort, he is willing to funnel information to Ámason that will help him take down his rival and his chief protector, Narcotics Squad chief Margeir, one of his dad’s old cronies. 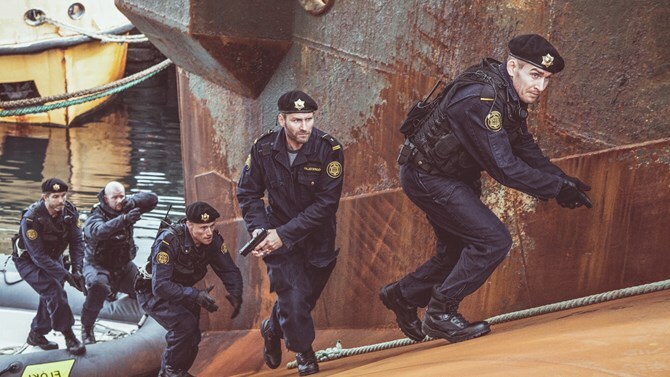 Playing it close to the vest, Ámason only recruits two allies: Ívar, the Armed Police squad leader who formerly thought so little of him and Andreas, Margeir’s former protégé, who has been assigned to desk duties following a violent assault. Yet, the bad guys still catch wind of his operation, which puts his family directly in harm’s way. Somehow de Fleur makes Twenty-First Century Reykjavik look like Chicago in the 1920s. For such a violence-averse force, he manages to get the Armed coppers into a heck of a lot of fire-fights (they’re going to need some serious counseling after all this). He gives the super-slick Miami Vice tradition a cool Nordic makeover, but he is a little too enamored with the flashback as a narrative device. There are an awful lot of them in Blood, but some are much more effective than others. Darri Ingolfsson slow burns perfectly well as the annoyingly moralistic Ámason, but as is often the case in genre cinema, the colorful supporting cast really helps make the film. Ingvar E. Sigurdsson is clearly having a blast as the devious Gunnarson, while Sigurður Sigurjónsson oozes rodent-like oiliness. J.J. Field also does his best Jude Law impression in his brief appearances as Sergej’s British money man, chewing on as much scenery as time will allow. Technically, Blood is a sequel to de Fleur’s City State, but no previous familiarity is required to enjoy the follow-up. It doesn’t even feel like it is calling back to a previous film, but presumably it is even richer if you have that background in your mental DVR. Frankly, nobody does these sorts of films better than Hong Kong auteurs like Johnnie To and Andrew Lau, but de Fleur makes a real go of it. 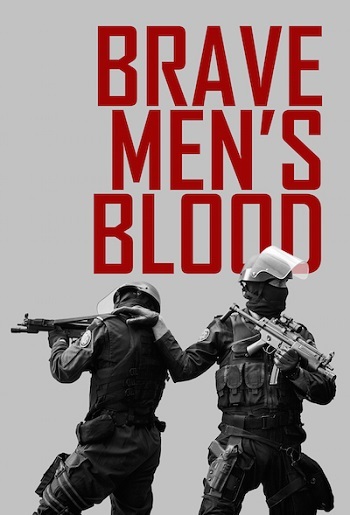 Recommended for fans of stylishly cynical crooked cops-and-gangster movies, Brave Men’s Blood launches today (9/1) on VOD, from Oscilloscope Laboratories.